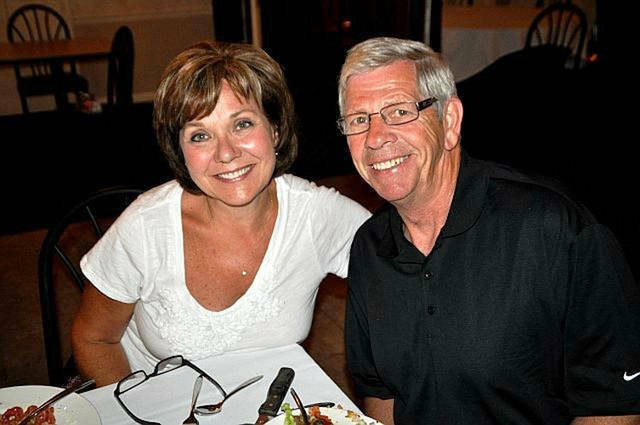 The Steve Knapke Memorial Blood Drive will honor the memory of Steve Knapke (right), who was killed in a crash caused by an impaired driver that also seriously injured his wife, Lois (left). VERSAILLES – The Steve Knapke family again is partnering with the Versailles Poultry Days Committee to sponsor the second annual Steve Knapke Memorial Blood Drive from 12:30 to 6:30 p.m. Monday in the Versailles Knights of Columbus Hall, 8440 State Route 47. Knapke was inspired to become a blood donor after surviving a 1988 accident caused by an impaired driver. He suffered a head injury and received blood transfusions. He later became a platelet donor and totaled 81 lifetime donations. Knapke was the victim of another accident, again caused by an impaired driver, on Sept. 11, 2016 that claimed his life and seriously injured his wife, Lois. The Knapke family said Knapke believed it was his duty to “give back” to help others and thank donors for saving his life. The family joined with the Versailles Poultry Committee blood drive for the first Steve Knapke Memorial Blood Drive and helped increase donor support by 30 percent. They remain dedicated to continuing his legacy of giving blood by encouraging others to donate. Donors continue to have the opportunity to donate platelets and plasma at blood drives hosted by the Versailles Knights of Columbus. CBC is expanding that opportunity to other mobile community blood drives. Platelets and plasma are vital to the treatment of cancer, organ transplant, burn and trauma patients. New platelet donors are in high demand, especially those with blood types A, AB, or B-positive. Individuals can find out more at www.GivingBlood.com or talk to an apheresis specialist at 937-461-3220. Community Blood Center/Community Tissue Services is an independent, not-for-profit organization. Community Blood Center provides blood products to 25 hospitals and health centers within a 15-county service area in the Miami (Ohio) and Whitewater (Indiana) Valleys.